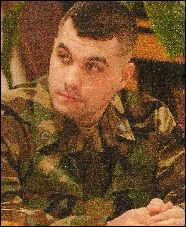 Army Sergeant Justin Ellis joined the US Army in Weathorford, Texas in May of 1998. It was his belief that it was his path to serve the country and to do his part for society. Sergeant Ellis was awarded the Silver Star, Bronze Star and Purple Heart for his exemplary service. On May 6, 2007 Sgt. Ellis was in Sadr City in a convoy that was struck by an IED containing an estimated 200 pounds of weight. The vehicle Sgt. Ellis was in was knocked over into a ditch. As soon as Sgt. Ellis regained consciousness he began dragging members of his crew away from the catastrophically damaged vehicle toward safety. While trying to render aid to his crew, they came under direct small arms fire. Sgt. Ellis was struck in the trauma plates by small arms fire. He and his crew were aided by the rest of the team minutes later and medically evacuated. After life stabilization methods were applied Sgt. Ellis was flown to Germany and then to BAMC in San Antonio where he had multiple surgeries, therapies, and was reintegrated into ci-vilian life for over a year. Sergeant Ellis and his wife Stephanie will be recieving a home in Hempstead, Texas to be closer to family.